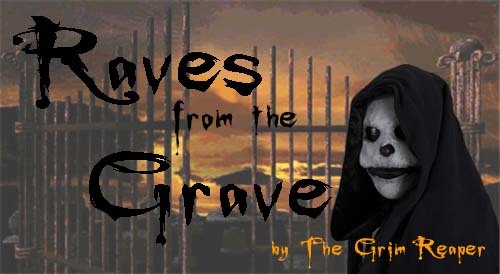 Always a fan favorite, The Grim Reaper is one of the founding members of The Patient Creatures, and always an impressive presence. Known as more of a quiet type, we have finally managed to coax him to express his own thoughts and ideas. Last holiday season I wrote that I wanted a Tickle-Me-Elmo in my stocking. Was that too much to ask for? Apparently so. So, I'll set my sights a little lower this year. This year, I won't ask for anything that requires any work from anybody. I won't ask for something that costs any money. I won't ask for anything that requires batteries or some assembly by an adult. I won't ask for anything from you or anybody else at all. What do I want? What could be so easy that nobody has to do anything? And that's what I want. Nothing. Is there nothing you want; nothing at all? Good. Because that's what I'm getting everybody this year too. Or, as Oprah would say, "You get nothing! And you get nothing! You all get nothing!" And you can join with me and get nothing for all of your friends, nothing for your brothers and sisters, nothing for your parents, nothing for your cousins or for your aunts and uncles. OK, I hear you. "Nothing is fine for you, Grim; if that's what you really want. But I really want to get something for my friends and family. Don't worry. It turns out you really can get something for nothing, something very special. Don't give any trouble. Don't give any hate. Don't give any arguments. If somebody cuts you off in line, don't give it a second thought and don't give them the satisfaction. Without hate, without confrontation, without violence, without fear, without trouble, do you know what you have? Do you know what the Grim Reaper gets? You want any others ideas?